Unlike inductive loads, capacitive and lamp loads are prone to high inrush currents that can lead to faulty operation and even contact welding. When switching charged capacitors (including cable capacitance) a sudden unloading can occur, the intensity of which is determined by the capacity and length of the connecting leads to the switch. This inrush peak can be reduced by a series of resistors. The value of these resistors is dependent on the particular application but should be as high as possible to ensure that the inrush current is within the allowable limits. The above diagram illustrates a resistor/capacitor network for protecting a switch against high inrush currents. 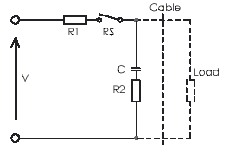 R1 and/or R2 are used depending upon circuit conditions. With lamp load applications, it is important to note that cold lamp filaments have a resistance 10 times smaller than already glowing filaments. This means that when being turned-on, the lamp filament experiences a current flow 10 times greater than when already glowing. This high inrush current can be reduced to an acceptable level through the use of a series of current-limiting resistors. Another possibility is the parallel switching of a resistor across the switch. This allows just enough current to flow to the filament to keep it warm, yet not enough to make it glow. Lamp load with parallel or current limiting resistor across the switch.